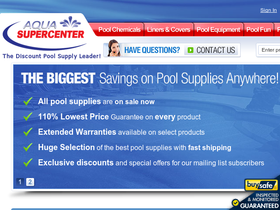 Aqua Supercenter, online at AquaSupercenter.com, is your destination for discount pool supplies. Aqua Supercenter sells auto pool cleaners, pool pumps, pool steps, swimming pool slides, chlorine, diving boards, pool floaters and loungers, pool heaters, pool heater pumps, and poolside furniture. Aqua Supercenter also carries vinyl liners, swimming pool timers, winter pool covers, salt chlorinators, pool paint, and pool cleaning equipment. RetailSteal.com has the best Aqua Supercenter coupons, Aqua Supercenter discounts, and Aqua Supercenter promo codes. Shipping and handling rates at Aqua Supercenter, depend on the pricing of your order and the destination for your shipping request. See website for full details, exclusions may apply. Hurry over to Aquasupercenter.com and save 5% discount on your order. Click here for code. Enjoy a $10 discount on your purchase at Aqua Supercenter. Use coupon with orders $200+. Use this coupon code at Aqua Supercenter and save $5 on your purchase of $100+. Click link and save. Shop at Aqua Supercenter and save 20%-70% on brand name pool supplies. Go to Aqua Supercenter for pool supplies starting under $5. Click link to shop and save on all your pool accessories. It's always Summer at Aqua Supercenter so head on over to Aqua Supercenter's super sale and save 30%-70% on all merchandise. Shop backyard accessories at Aqua Supercenter and find items starting at $14. Click link to save. At Aqua Supercenter find patio accessories under $20. Click link for savings. Get up to $100 off pool cleaners with mail-in rebates online at Aqua Supercenter. Click link to save.